(Newser) – Many people buy SUVs to keep them safe. 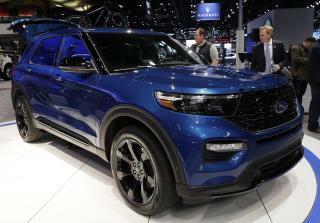 But while the Ford Explorer's size may help insulate passengers somewhat in collisions, owners have been complaining about another issue: They say their vehicles have been making them sick. Bloomberg notes that upward of 3,000 Explorer owners have filed complaints on fifth-generation Explorers built between 2010 and 2018, citing headaches, nausea, dizziness, and even "unspecified loss of consciousness," and the problem seems to stem from exhaust that may be seeping into the vehicle's cabin, perhaps causing carbon monoxide poisoning for anyone in the SUV. Drivers, including members of police departments, have tested positive for carbon monoxide exposure, and other owners, concerned by the headlines, have started driving around with portable carbon monoxide detectors, with varying results. I am looking for an SUV or a pickup truck to purchase. I have not seen encouraging data about the Ford Escape on the website maintained by NHTSA. This article confirms my suspicions that the Escape is to be avoided. Helping the Nazis, crappy cars and now carbon monoxide poisoning. Just another reason not to buy a Ford. Toyota: Building autos is about 2 things --- engineering and manufacturing. Ford: Building autos is about 2 things --- sales and marketing Toyota: CEO makes $2 million a year Ford: CEO makes $20 million a year Toyota; Rated 4.5 out of 5 for reliability by www.repairpal.com Ford: Rated 3.5 out of 5 for reliability by www.repairpal.com Personally, I support the company that supports me best. If they don't care about me, why should I care about them?